In Love Slaves of Helen Hadley Hall, James Magruder combines the sexual trysting and guilty pleasures of a telenovela with the witty dialogue of a drawing-room farce (though even better: this drawing room is a graduate residence hall in the 1980s). Lurking, of course, is the specter of AIDS, a presence that Magruder invokes with the fear and consternation befitting the time, though what wins is love and friendship, art and laughter. Magruder’s language is so precise, so beautifully crafted and bitingly funny, that I laughed throughout and then nearly cried when Love Slaves of Helen Hadley Hall ended. Love Slaves of Helen Hadley Hall, James Magruder’s glittering novel of the human heart (and other choice parts), gives us Yale at the dawn of AIDS: a party on a listing ship. Incisive, ironic, hilarious, bawdy, and sly. 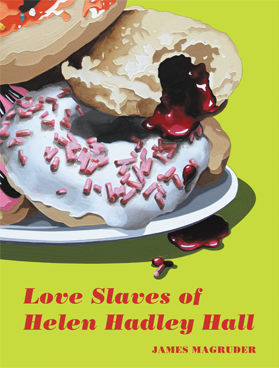 “Few books published today contain the pure enjoyment that Love Slaves of Helen Hadley Hall does. And none are better written. Where there are other authors aplenty that can make their readers laugh, Magruder’s is humor of the sort spun by Oscar Wilde or Dorothy Parker—stoked by intelligence mixed with a gift for the telling detail and an understanding of how the aches deep inside the sad hearts of humanity are ever the source of All Things Funny, with just a dash of the bitters plunked in at the end. And taking in all the glorious nonsense contained in the volume, the reader settles into his chair for a moment, the book newly closed and placed on his lap, and very seriously considers opening it again and starting over.